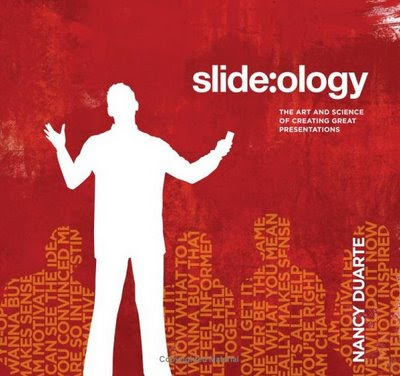 My latest read is a terrific book called slide:ology by Nancy Duarte. There is also a site by the same name with lots of on-going material related to the book which is filled with content from the folks at Duarte Design. This book is going to be right next to my copy of Presentation Zen by Garr Reynolds that I posted about back in May. I'm loving this book so far. It has some great stuff that continues to feed my desire to be a better, more effective and compelling speaker. I've become fascinated by the use of design principles to guide my presentation designs. I've had an opportunity to try out my new presentation style a couple of times now and I find the audience is more engaged and asks more questions and provides more comments and feedback at the end. A man came upon a construction site where three people were working. He asked the first, What are you doing? and the man answered, I am laying bricks. He asked the second, What are you doing? and the man answered, I am building a wall. He walked up to the third man, who was humming a tune as he worked and asked, What are you doing? and the man stood up and smiled and said, I am building a cathedral. In my work, I'm like the third guy. I wake up every day smiling because in my own way, I get to build a cathedral. It's about the bigger picture, the higher view, the life choices that have brought me to a place where every day I get to do what I truly love to do. I am surprised at how often I've been on site with a customer and find out that the recommendations I end up making were actually already suggested by the DBAs and/or developers on staff. I wonder why the suggestions of the employees aren't heeded and a consultant gets called in instead? It would seem that the company could have more effectively used the money and time spent to have a consultant tell them the same thing their employees are already saying. So, how does the staff DBA or developer get heard? It may not even be that what they have to say is set aside in lieu of a consultant's opinion. It may be a case where a DBA or developer suggests doing something that hasn't been done before and they can't get buy in from their managers and colleagues. Why? It's an interesting issue. My experience has been that many times I will be able to make recommendations or solve problems that on site employees hadn't been able to work out for themselves either due to lack of experience or lack of time to devote to solving the problem. Fortunately, I don't think I've ever left behind recommendations that failed and cost the company I intended to help, but I can't even count the number of times that my recommendations mirrored those that one or more employees had already made. So, how do you make your case? How do you get heard? Do you quit and contract back in as a consultant making 4 times more money? I've seen that very thing happen, haven't you? Do you offer to quit if your recommendation fails? Hardly. Outline the business case or situation in detail and note the business goal. Keep in mind that a business case is really a tool that looks at financial considerations. No matter what other elements may be viewed as relevant to the decision, if they can't be expressed in terms of their financial impact they'll have no influence on the results of your case. Provide meaningful options to accomplish the task/project. If the question to be answered can only have a "yes" or "no" option, it's easy to point to the winner. However, when you need to ask "which way" something will be accomplished, it is important to provide the options to allow the reviewers to step back and review options that reflect the most relevant means of accomplishing the business' goals. State the full costs of the task/project and any on-going support and of transition. This isn't just about the cost of doing the project, but costs of supporting it once it's over. Things like licensing costs, staffing costs and costs of ongoing problems the project didn't intend to fix (perhaps only postpone). The full cost isn't just the cost to do the project, but is the full cost to the business of making a specific decision. Show both the good and bad impacts of change. It is possible that along with the positive consequences of the project, there may be some negative consequences as well. This could include positions needing re-defined, transition costs and ongoing process problems that the project won't resolve. Ensure the benefits of your recommendations are attainable...and can be measured. Be able and prepared to show before and after comparisons. Know what metrics play a role in the decision-making process (and how). There are a host of metrics (some concrete and some fuzzy) that are considered when any decision must be made. And many times there is no collectively agreed upon way of measuring them. The key is understanding what your audience is looking for in terms of metrics and what they are going to make a decision based on. You need to know what they're looking for, what thresholds are relevant to them, and how they are used to seeing these metrics presented and lay them out that way. Tell a story. The bottom-line is that your case is made by answering two fundamental questions: "Should we do this?" and "Which way is most effective to accomplish it?" Write up your recommendations and plans as if you are telling a story that answers those questions. Establish the background, introduce the problem and define why it is important to solve the problem. If you don't solve the problem, what is the consequence? What are the various way sthat you could solve the problem, and what will happen to the organization in each instance? And based on all of that, what is the conclusion your want your audience to draw and the action you recommend taking? Make sure you tell the story first, and then fit it into the template of your case. Everyone can learn to make a case strongly and effectively. You can make a case that is polished and persuasive. In time, results will back up your proposals and consultants can be used as they should be and not just to confirm what full-time employees already know. My friend Jan is cool. He sends me lots of neat SQL performance issues he's working on so I canto take a look at. I love it when I get to see performance problems get fixed and have the before/after data to show the differences. Like I said, Jan is cool and sends me lots of good stuff like this. By the time the whole query is done we have child_number 0..30, and about 360 sessions because of all the parallel slaves! Weirdest part is the 'cursor: pin S wait on X' plus 'PX Deq: Parse Reply' waits, they take > 8 seconds every time! Why would it parse over and over again??? and there are a few dynamic system views that provide more information about this timed event: V$MUTEX_SLEEP and V$MUTEX_SLEEP_HISTORY. You just have to check those views while the problem is occurring to get the additional info. There's not a whole lot of data on this floating around out there, but I found some interesting info from Tanel Poder and Jonathan Lewis that helped. Anyway, the second issue was the PX Deq: Parse Reply waits. I was wondering why all the parsing was going on and guessing that if the parsing issue was resolved, that would also reduce or eliminate the pinS waits as well. I wrote back to Jan about the small bit I knew and told him I thought that rewriting the query to combine several of the separate SELECTs together would likely help the problem. At a quick glance, there were 18 of the SELECTs that shared the same FROM clause and join conditions. Today I did a bit more research to check out the 'PX Deq: Parse Reply' and came across a great write up at Doug Burn's blog about Parallel-specific wait events (the whole article starts here). Good stuff...check it out. Then, just a few minutes ago, Jan sent me the update on how he was progressing. BTW, this table is partitioned, so it's using parallelism. The original query had mostly group by's. But there where a few SUMs without group by's. That's what is causing the trouble. v$sql_shared_cursor says it's because of a PQ_SLAVE_MISMATCH. When running serially it doesn't happen. After rewriting the troubling parts to do a group by, it's back to normal. After a total rewrite, the query is much faster. Again, I love stuff like this. I thought it would be an interesting case to share. A co-worker returned recently from a developers class for some aspect of .Net. He found it quite funny when he discovered some MS employees taking the class, running Vista in a VM. My MacBook Pro is also running Vista in a VM, but I rarely touch it! But, the fact that MS employees are using Macs with VM for Vista says it all if you ask me. All hail the Mac! If deer meat is called venison and cow meat is called steak, why is chicken just called chicken?